← Are Prospects Really From Another Planet? 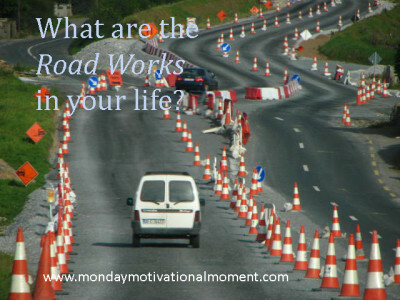 What are the road works in your life? corner I was confronted with road works. I had planned my trip based on everything going well and road works were definitely not in his plan. Worse still, these were serious road works with workmen holding stop signs and traffic was banking up. As many of you know I took the challenge earlier this year to run 5km and decided to use the Smartphone app “couch to 5K”. Being a positive person I expected to just follow the program exactly and magically achieve my goal. I was not prepared for the struggle at the 3K mark and seemed to hit the wall. I find no matter what I do in life, in business or sales, challenges occur. It may be as simple as road works or hitting the wall in a running program. Sometimes it is a prospect saying “no” and sometimes it is something life threatening. It is not the fact a challenge happens which determines success, it is how you deal with the challenge. I could take a risk and speed. Of course the risk was I could still be late, be pulled over by the police and loose my licence, arrive in a grumpy mood or, worse, have an accident and not arrive at all. I could also accept the fact I was going to be late. Of course I took the later. In fact I stopped, knowing I would be even later, and called my prospect explaining the situation. Much to my surprise they were human and understood. In that moment, stopped at the side of the road, I established rapport with my prospect and when I finally arrived closed the opportunity. Push that little bit more. Of course I took the latter. Over the next few days I increased just 100 meters more each time. Yesterday I ran my first full 5K with a bit in reserve. So your client says “no” – what next? If they are convinced they need the product or service you offer, they are not convinced you are the right person to buy from. “No” is like road works or hitting the wall when running. It stands in the way of a decision to buy from you. Of course, if I have tried to shortcut the sale without building rapport, it is usually obvious by their body language and cold words. People are human so invest time in building rapport each and every time you meet them. It is easy to assume rapport, especially with someone you know well, or your husband or wife. To influence them or make a sale they will only buy or agree with you once in rapport this particular time. Accept there are road works and blockages in everything you do. It is how you deal with these which will determine your ongoing success. Make every step, even the ones you find difficult, count. When you hit the wall it is a matter of just taking then next step and before you know it the “No” turns into a sale or a positive decision. This entry was posted in Monday Motivational Minute and tagged blockage, closing, hitting the wall, Positive attitude. Bookmark the permalink.